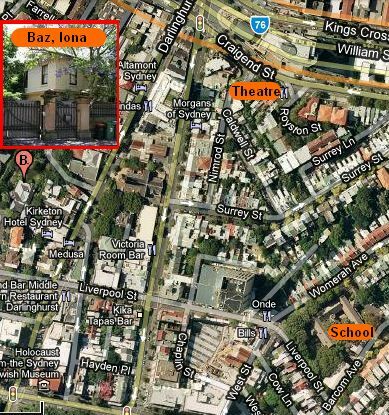 If we are really going to shake a spear at ignorance, the area in which we are based, the traditional heart of Australia’s Entertainment & Theatre District – Darlinghurst / Potts Point / Kings Cross, with Fox Studios not far away – should be pioneering the way forTheatre in Education, TIE. Baz Luhrmann lives just up on the hill at historic Iona House will be making The Great Gatsby at Fox Studios. He is the ultimate prodigal son for the area, and has roots in both Theatre and Film already – including a modern interpretation of Romeo and Juliet with Leonardo Di Caprio, who will also be his Gatsby. Why don’t we have school excursions to Fox Studios, especially during the making of Gatsby. We’re sure it would be nothing for Baz (who knows, Leonardo might tag along) to wonder down the hill, pick up a coffee from his favourite Victoria Street Lateria cafe, and on a little further to his local Primary School and give a short 10 minute pep talk to the kids on the importance of Theatre in Education on his way to Fox Studios to shoot Gatsby. All it takes is an invitation note his Iona House mail box from the Principal and the Inaugural School TIE President. Fair Dinkum Rating – FDR 5 stars for Baz and Leonardo!